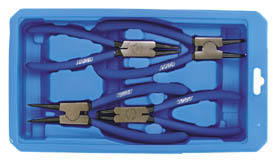 Home » Parts Shop » Draper Tools » Workshop Tools » SET OF 4 CIRCLIP PLIERS. Industrial quality, chrome nickel steel hardened and tempered with a polished finish, chemically blacked tips and special non slip cushion-grip handles. Display packed in blow mould storage tray.